My idea was to follow the length of a spring-fed creek . . . Along the way I found beautiful little waterfalls . . .
. . . And colorful rock formations . . .
. . . Until I finally reached the headwaters pool. The other day I got an idea for a low-cost trip that led to one of the most enjoyable experiences I’ve had tenkara fishing. My adventure was no rival to Roosevelt’s arduous descent along the River of Doubt in 1914. Instead, it was more like a leisurely amble up the “creek of uncertainty.” It was a lot of fun, however, so other anglers might like to try their own version. My goal was to follow the length of a spring-fed creek, from its mouth to where it flows out of the ground, or at least as close as I could get, and learn as much about that little stream as I could. My idea was to make a longer study of the water, instead of hop-scotching from fishing hole to fishing hole, as we so often do. It figured to be an all-day journey, so I packed my Zimmerbuilt guide sling with food, water, a light tarp, and an emergency kit, plus a box of flies, and started out. My rod of choice that day was my Nissin Fine Mode 270 — short enough for the tight spots, supple enough for delicate deliveries, but with enough backbone to steer a bass or small catfish away from snags. I went by myself, but I also made sure that my wife had my coordinates. Accidents and illnesses can happen, and they seem to occur most often in remote locations. Prepare and take care! Let me say that this kind of trip in Texas can be a challenge because over 95% of land is privately owned. 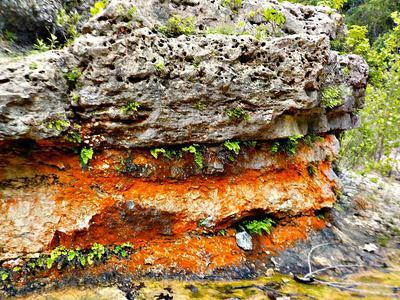 Much of the public land was sold off to pay for Texas’ war debts, so most acreage is hard to access unless you know someone or are able to travel to one of the bigger state parks or natural areas. I know it’s crazy, but I felt like Daniel Boone, exploring and listening, stepping lightly and studying the brush along the creek . . . catching the flit of a cardinal through the undergrowth and even spying a wild turkey trotting up a ravine. The fishing was good along the entire stretch of the short creek, but it was interesting to see how the species changed as the water became shallower and tighter. I caught a nice largemouth bass on a cricket at the beginning, followed by several different types of sunfish as I climbed higher and the creek narrowed. The final headwaters pool was populated with red shiners, and I caught a couple of them on a size 20 black beetle. At midday I pitched a ground cloth and took a nap on an ultralight inflatable pillow I always bring. A soft place to lay my head made all the difference in the world. For lunch, Robin had packed a turkey sandwich, plus a slice of purple cake that stained my tongue but brought a smile to my lips. Turns out that purple cake is just the right dessert for a fishing trip. The sandwich made me think of that tom turkey I’d spotted earlier. He didn’t know how lucky he was. The Nissin Fine Mode was a good choice — strong enough for the bass but sensitive enough for the shiners. It cast everything from live crickets, to size 16 red epoxy ants, to the size 20 beetles. It’s tough to find one rod that will do all of that in style! How long did it take? Well, pretty much all day, but it was one of the best days I’ve spent in a long time. Beauty, bold colors, hidden pools, and picturesque waterfalls appeared in unexpected places. I took my time, picking my way along and stopping when I felt the urge. I fished steadily, but it really didn’t feel like a fishing trip . . . maybe just a gentle exploration. I’d encourage you to find a similar journey that fits your location. Make this a leisurely hike, a relaxed tenkara or keiryu experience where you endeavor to learn a ribbon of water . . . its plants, animals, and fish. Make it safe and enjoyable, and stay within your limits. The most common danger is probably falling on slippery rocks. A wading staff can be a big help. In remote locations, consider one of the various satellite trackers and emergency beacon devices as explained and commented on in Kristine’s TenkaraBum blog post of March 11, 2017 (“A Cautionary Tale”). There’s a lot of beauty in small places if a person knows where to look. It’s worth every minute. I always wonder about the fishing possibilities of the small creeks and ponds I pass by in my travels. Your story makes me want to investigate them even more. Nice Jewel of a Stream! Another tip. Google Earth is a great resource for checking out possible gems to fish ahead of time. I have been exploring several on Google Earth, and one possible gem has a two mile stretch between the freeway and the railroad. That said it looks like it is surrounded by trees, and apart from the noise of the train and traffic, it may just be a hidden gem close to home that feels like you are really a long way from civilization. There is also a small pond that may have some interesting fish in it as well. I plan on checking it out soon. 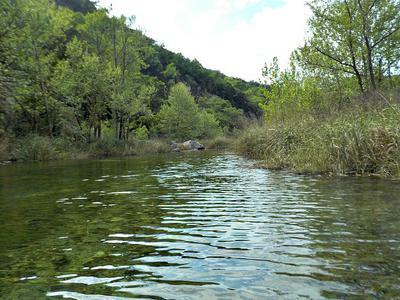 John, I am going to be in Texas the end of June, so I am planning on getting down to Lost Maples one of the days I am there for my meetings. Thanks for sharing a great day on the water. Small creek fishing has become my favorite type of tenkara. Thanks for the well written report John, I particularly enjoyed the Texas history tidbits. This is pretty much how I like fishing as well, some exploration, some fishing and a good measure of self reflection. Thanks, fellows, for the comments. 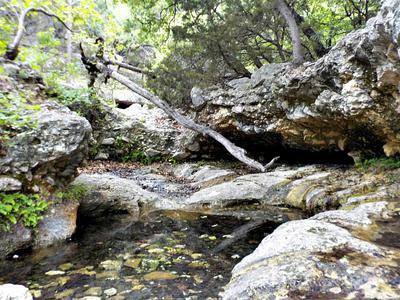 Les, for what it's worth, the creek in my photos is in Lost Maples! When you get into the natural area, just park at the visitors' center (opens at 8:00 A.M.), get your permit, and walk 100 yards to the first low water crossing. Wade in at the water crossing on the left and start fishing. Again, your entry permit is all the fishing license you need right now in the state parks and natural areas. The end is a long way up! I love to do just that explore! That sounds like fun. Get lost or close enough for government work. Take your time. Fish along the way. Keeping a watch on the sun judging your time. Living in the moment. Envy; that's another way to put it. Man I need to get out. One of my favorite things to do as a kid was to walk creeks, with or without water. 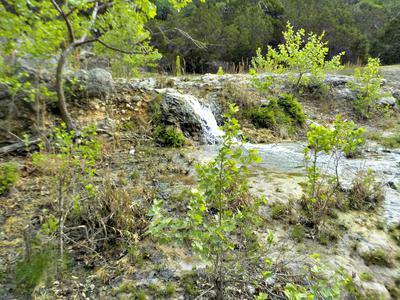 Many Ozarks streams are intermittent due to the underlying karst geology. So it was mostly walking the bed of the creek between deep pools. I'd find arrowheads, fossils and cool rocks. I'd enjoy watching the fish, crawdads and other wildlife. I'd often pack along a short UL spinning rod and some Beetle Spins or crappie jigs to catch the sunfish and occasional bass. This is a pastime that I need to revisit! I have just the rod for that! Well, it turns out that I have just the spinning rod for that kind of fishing. It is short! Just 3'9", rated as light light (between light and ultralight). The short length should make it ideal for fishing in tiny overgrown streams. It is a two piece rod, and broken down its only a few inches longer than a collapsed tenkara rod, so it won't tower over your head if you carry it attached to a backpack or sling. It will fit in a Medium Rod Case. It's the Tenryu Rayz RZLL39 on my finesse-fishing.com site.